Today I’m bringing you a different kind of post than is typical at RealLife. One of the greatest reasons to learn another language, like English, is that it opens up so many opportunities to travel! I came to Barcelona a little over a year ago and I can say without a doubt it’s one of the best decisions that I have ever made. I am SO grateful that I have had the chance to live here. Barcelona is one of those one-of-a-kind places; it does not look or feel like any other European city–and the list of new things to discover is endless. 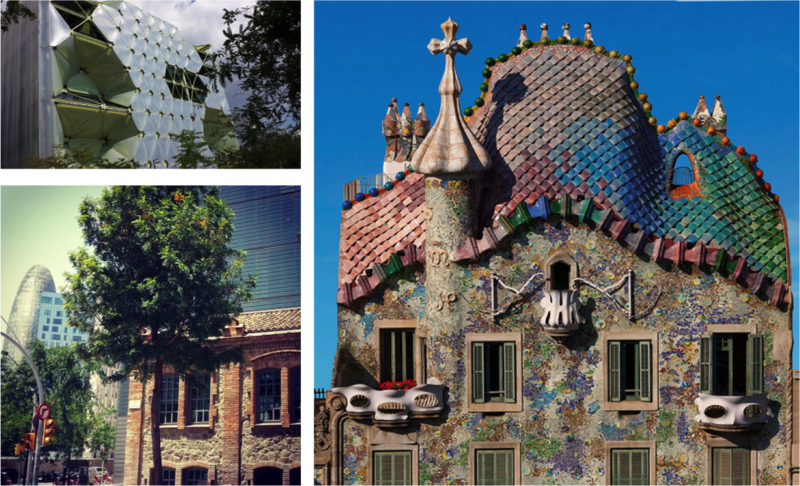 It’s no wonder that I’ve made myself so at home here–spending the year exploring the medieval, gothic, Catalan modernisme, and post-modernism that mix to create this oh-so-charming city. Whether it’s getting lost in the curvy labyrinth of the Barri Gòtic, taking in panoramic views at the castle of Montjuïc, or exploring other corners of Catalonia–Barcelona is a place that everyone should consider visiting–the longer, the better. Next week I’m leaving, off on another adventure, but I hope not too long because Barcelona is definitely a place where I need to spend more time. I want to give a little bit back to this city that has given me so much by sharing everything that I love about it. So here you have it, 29 things that I love about Barcelona, and why you just might need to put it at the top of your list of places to visit. As this is a blog about language learning, English in particular, this seems like an appropriate place to start. Barcelona is in Spain, but what many do not realize is that it is the capital of the Autonomous Community of Catalonia, and in Catalonia the first language is Catalan, not Spanish. Many people come here to study Spanish and are surprised when they arrive that most signs and menus are in Catalan, and often the language you hear spoken in the streets of Barcelona is Catalan. 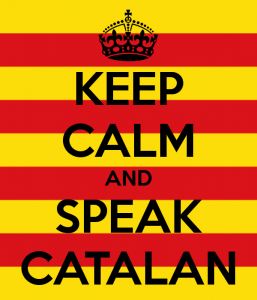 When I first came to Barcelona, I had no plan or desire to learn Catalan. I had previously lived in Palma de Mallorca, another place where Catalan is a second language, but still didn’t know more than a few words. I didn’t think that Catalan was important then, and I didn’t see why it would be any different here in Barcelona. However, I was surprised how much more common the language is here than in Palma. As I began making local friends, I realized how important Catalan is if you not only want to live here, but actually form a part of the society. Sure, everyone is happy to speak Spanish with a foreigner (no one will force you to learn Catalan), but if you go with a group of Catalans they will often innately speak Catalan together (in fact, it’s been fascinating to observe how people here switch between the two language, but perhaps that’s a subject for another article! 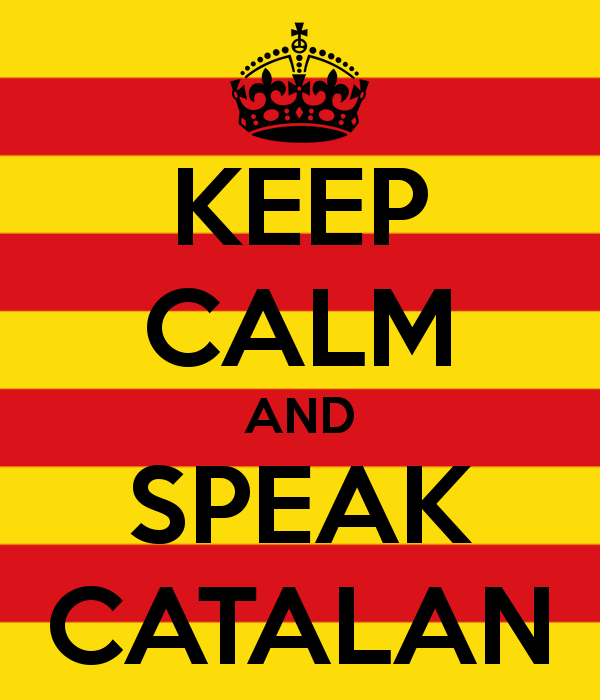 ), so to really fit in with the group knowing Catalan is very useful. Also, if your main goal is to study Spanish, a better choice might be Granada, Madrid or Salamanca–just saying. 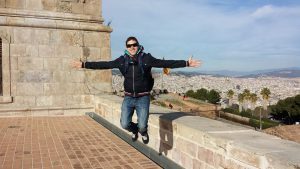 After about one month here in Barcelona, I decided to start learning Catalan, and quickly grew to love it (see me speaking it here) taking inspiration by surrounding myself with the culture. For a linguaphile like myself, it’s been wonderful living in a place where I can speak both languages daily. If you are a polyglot, or aspire to be one, I highly recommend living in a bilingual place like this. And on this subject, Barcelona, like many European cities, is an international melting pot. This means that people from all over Europe, and all over the world, congregate here to travel, work and live. In my group (other than locals) we have friends from the UK, France, Germany, Poland, Czech Republic, Italy, Russia, Brazil, Peru, Chile, Argentina, Venezuela, and I have met tourists from every other corner of the world. If you are a proactive polyglot, you could potentially practice every language you know in one night. In Barcelona, you can find several popular language exchanges and a very successful weekly Couchsurfing meetup. It’s common that foreigners from all over the world will go to these types of events. By being active and friendly, it’s easy to practice all sorts of different languages besides the locally spoken Spanish and Catalan. For some reason, in other parts of Spain, Catalans have obtained a reputation for being cold and unfriendly. However, in my experience, this is very untrue. I have found Catalans to be kind, receptive, polite, and open. They may not be as warm as Canaries or Andalucians, who are renowned for treating you like their best friend the first time you meet, but when you make a friend here, in my experience, they are reliable and helpful. It never gets old going to buy bread at the neighborhood bakery and having the cashier lady say, “Aqui tens, guapo!” (here you go, handsome! ), as she hands you your coffee. No, this isn’t flirting. It is just common for people, especially older people, to affectionately refer to others, even strangers, as guapo(a) (handsome/beautiful) or carinyo (darling). Most people here are very laid back; so don’t expect punctuality across the board (of course, you should never generalize too much). Get used to others taking their time, and enjoy taking yours. In general, I have found that people here are much better at living in the moment than in other countries. Like most cities in Europe, here you can feel history come to life. Funnily enough (and surprising to many people here), I took a Catalan Culture class at my university back in the United States, which made the experience of coming to live here that much more amazing because I could see with my own eyes what I had already learned so much about. In fact, I’ve often known facts about the city that my friends who live here were not aware of. In the rest of this article, you’ll be able to experience some different aspects. In general, Catalans are very proud of their nation and love to share the culture with foreigners. They are also the most nationalistic people I have ever met (in a good way! ), regardless of whether you are pro-independence, it is amazing experiencing the energy manifested here during peaceful protests. Ahh, you gotta love the Barcelona Football Club (el Barça) living in Barcelona. Well, actually, I already loved them. I became a fan living in Palma, as I would go and watch almost every game with my roommates, but nothing beats the energy at a real, live match! If you come to Barcelona, it doesn’t matter who they are playing, just make sure to get your tickets. Last year I got to experience my first Catalan Christmas; they have some pretty odd, yet charming traditions. 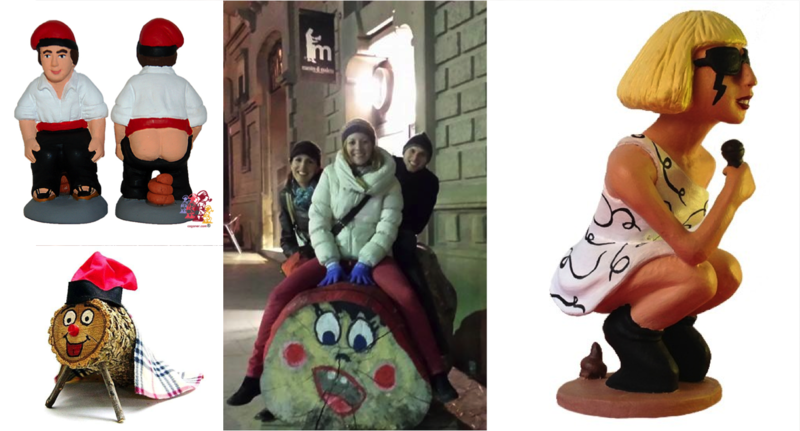 First, instead of Santa they have the Tió de Nadal. This is basically a small log with a face painted on one end and traditional Catalan clothing that children hit with sticks until it “poops” turró (flavored Christmas nougat) or other presents. There is a traditional song that children sing while hitting him; you can hear it here. You might start to think there is an obsession with excrement, because the next Christmas tradition is Caganers (Shitters). Like most Christian places, in Catalonia it’s traditional around Christmas to set up a Nativity Scene. But in Catalonia what’s different is that they also add to it a Caganer, which can be traditional or not so traditional, featuring celebrities like Michael Jackson, Lady Gaga, and Barack Obama. Don’t get me wrong; Christmas time in Catalonia is incredible. They just have a couple of hilarious traditions to bring in the season! Above all things that I love in Barcelona is the lifestyle. This is what makes living here day-to-day so enjoyable. A typical example of this is the café-culture, which I feel is rarely found in the United States. Here it’s common mid-morning to take a break from work and grab a coffee and snack with co-workers or friends. Most often you will sit outside on the patio and watch people passing by. It’s a really simple and fulfilling part of the day. It is also common here to get together with friends for a coffee or beer and just talk. In the United States it is becoming less and less common to just talk without the distractions of smartphones or TV. It is also rare here that you have a family meal in front of the TV. This of course depends on the family in the U.S., but in my family, for example, we usually watch a show while we eat dinner. Obviously, this prevents you from talking, which creates a more unsocial family-dynamic. In Spain, in general, mealtime is family-time. It’s a tradition that I really love. In general, there is a much closer, social lifestyle, which facilitates connection (which of course is awesome for practicing a second language!). I love the menú del día, which is served in most restaurants during lunchtime. This is a set 2 or 3-course meal with bread and a drink included often for less than 10 euros. Did I mention that that drink can be an entire bottle of wine (or as much of it as you can drink) for no additional charge? It’s awesome, as long as you don’t have to work afterwards! The food is usually really good (generally you get a soup, salad, or something else light and then some sort of meat or fish), so it is a great way to fill-up without breaking the bank. If you visit Barcelona, be sure to eat one day at Els 4 Gats. It’s a well-known restaurant in the gothic area, where famous inhabitants of the city (like Picasso) used to hang out. The menú is a bit more expensive (16 euros), but the food is excellent, and you can see for yourself the ambience. Hey, if it’s good enough for Picasso, it’s good enough for me. Tourists generally come to Barcelona wanting to have the typical Spanish sangria and tapas, but this is not the typical place to have it. You can find good tapas and terrific Sangria here, but too many people get sucked into tourist traps on Las Ramblas where the paella is frozen and the sangria comes from a carton that you could buy for less than a euro at the supermarket. Typical Catalan dishes include a lot of fish and seafood (check out la Paradeta), escalivada–roasted eggplant and red peppers that you can serve with pretty much anything (great on pizza! ), esqueixada–salted cod with peppers, tomatoes, black olives; and toasted pa de pagès (farmer’s bread) with a variety of toppings on it. 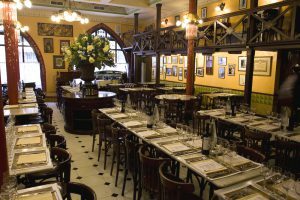 In addition, Barcelona is a metropolitan city that offers a variety of restaurants serving up every type of cuisine: Mexican, Vegan, Vietnamese, Peruvian, American, etc. I think the only thing I’ve missed from the States that I can’t find here is typical New Mexican green chili and Chipotle. Two of my favorite things are definitely good cheese and wine. This might sound more like a French specialty, but Catalan wines and cheeses are just as good (if not better!). My favorite restaurant here in Barcelona is Can Recassens. They specialize in different types of cold cuts, cheeses, and high quality wines. Not to mention, the ambience in the restaurant feels like something from a fairytale. Every person I’ve taken there is awestruck. I typically order the fusta de formatges catalans (catalan cheeses), a side of pa amb tomaquet (bread with tomato) and a bottle of red wine (my favorite is called llàgrimes de tardor). Another tradition typical in Catalonia is the calçotada, which is typically celebrated at the end of winter and beginning of spring. It consists of grilling a special type of onion that you then eat accompanied by a special sauce with your hands. It’s a great excuse that time of year to be with friends and family and enjoy the warming spring weather! If you get bored in Barcelona that’s your choice because night or day there is pretty much always something happening. From trying new sports like paddle boarding, to yoga and meditation, hiking, brewing beer, or sampling tapas Barcelona is the place for new experiences and meeting people. 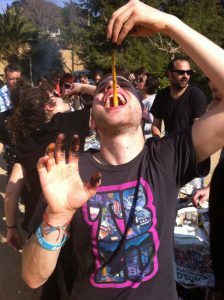 If you’re in Barcelona and have an afternoon or evening free just look on Couchsurfing, meetup.com, or at Facebook groups and events and you are guaranteed to find a plethora of fun, interesting activities. One of the reasons that Barcelona has a profile as such a unique city is the grand mixture of different architectural types–and particularly the contributions of Gaudi and the modernisme movement. It’s common to happen upon a random cool structure in practically any part of Barcelona, which makes exploring quite fun. Since moving to Barcelona I’ve become a more avid runner. It’s become my perfect excuse to get out of the house and run along the beach boardwalk (see first photo). It’s seems like the beach is where life is always happening, so it’s the perfect place to go for a walk, a run or a bike ride. 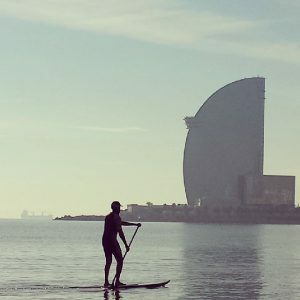 On my runs along the Passeig Marítime (the boardwalk in front of the sea) I would often enjoy observing paddle boarders and surfers, elderly playing dominoes or petanca (bocce ball) and drinking (even in the morning), and tourists talking selfies. After a long, stressful day it was exactly what I need to bring myself back to life and remind myself of what an amazing place I live in. 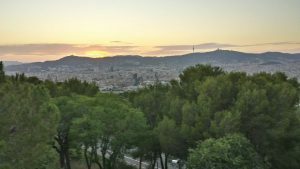 One of my favorite places in Barcelona is the lone “mountain” to the south, Montjuïc. There you can find the old stadiums from when the Olympics were hosted here in 1992 as well as the exquisite Palau Nacional and Plaza de España. Much older than all of this is the castle of Montjuïc, at the southern point. It’s been one of my favorite places to run to because after the steep climb I was always rewarded with beautiful views of the city. There is so much to see outside of Barcelona, and I’ve barely scratched the surface–all the more reason to return! A couple of my favorites have been some beaches of the Costa Brava (e.g. 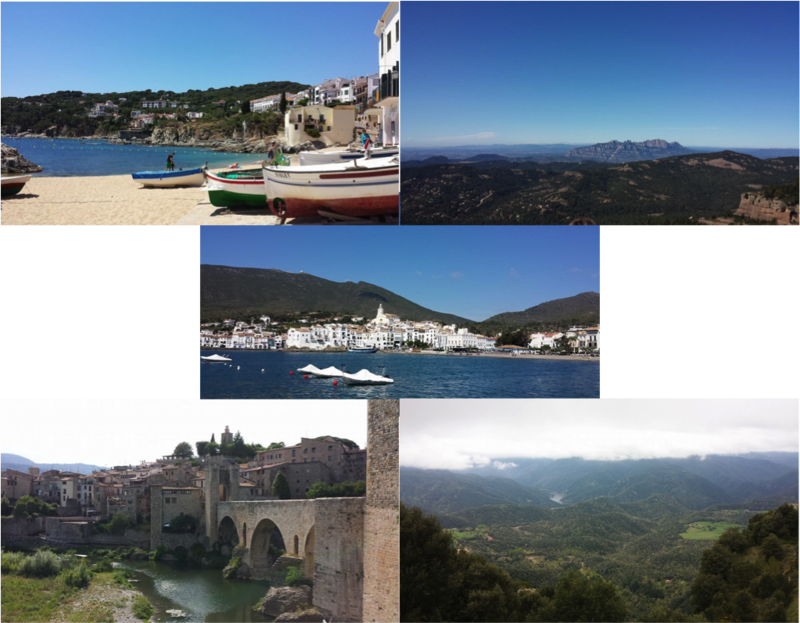 Aiguablava and Calella de Palafrugell), and medieval towns like Vic, Besalú, Pals, Gerona, Rupit, and Tavartet. If you know any must-sees for when I come back, please let me know in the comments below! I come from Colorado, where people are extremely active and love activities outside, so the fact that most Catalans are very similar has helped me to fit right in! Montserrat is an amazingly unique place that can’t be missed, and I also really enjoyed hiking la Mola, where it feels like from the top you can see all of Catalonia. One of the most incredible, though, was a hike near the village Campdevànol called Ruta dels Set Gorgs (Trail of the Seven Pools). This trail follows a creek up past seven waterfalls and natural pools–amazing for a hot summer day, despite the crowds. When I come back, at the top of my list is to ascend Pedraforca, one of the most famous mountains in Catalonia. In Catalonia, like in most parts of Spain, during the summer each town has it’s big festival, or festa major. With enough motivation and time, one could potentially go to a festa major in a different village every weekend, so it’s easy to have fun in the summer. Festa majors typically have games and spectacles during the day, and concerts and parties at night. I talk about some of the particularities of every Catalan festa major below. Correfocs is a common tradition in which one runs from people dressed as devils or other mythological creatures with pyrotechnics. Afterwards, there is the correaigua, in which everyone gathers in a square to be sprayed by fire hoses and dance to traditional music. These are human towers. I have never seen anything like them anywhere else in the world, and in fact they are a UNESCO Immaterial World Heritage. It’s quite incredible watching them construct the tower by climbing on top of one another–and the most impressive is that the people at the top have to be children (obviously because they weigh less). Something that has surprised me a ton is how much great Catalan music there is. This is something that inspired me a lot when I first started learning Catalan. I was able to listen while looking at the lyrics and begin to decipher many small differences between Spanish and Catalan, as well as acquire a bunch of useful vocabulary, which then allowed me to begin speaking to my friends. There is a lot of independent (indie) and alternative Catalan bands, which is one of my favorite genres. So it’s no wonder I was able to find all sorts of music that I enjoy. There is also a lot of great Catalan rock, both classic and modern, which could almost be compared to the movement of the 60s and 70s in the United States and the UK. Some of my favorites include Txarango, Els Catarres, Acció, Blaumut, Els Amics de les Arts, Joan Dausà, and MiNE!. Catalonia is an awesome place for festivals–one of my favorite ways to spend my time in the Summer. Other than local bands playing at the Festa Majors, you also have gatherings like Primavera Sound and Barcelona Beach Festival, which attract big names in Pop and Electronic music. 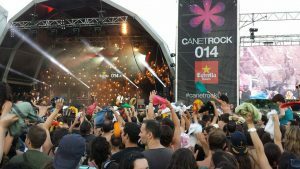 Over the summer I went to a particularly incredible festival called Canet Rock, a revival of a festival from 1975, which could be compared to a Catalan Woodstock. It featured some of the most popular bands in Catalonia, like Els Pets, Txarango, Blaumut, Love of Lesbian, etc. Over 25 thousand people came to enjoy the festival, and it was so densely populated that cellphone coverage was lost. For me it was one of the highlights of the summer. Some people here will translate it directly to Spanish (hacemos un pensamiento? ), but to me it sounds quite odd and I don’t think it would be understood outside of Catalonia. The schedule in Catalonia, much like in other parts of Spain, is completely different from other parts of the world. However, it’s not too hard to get used to, as long as you’re ok with eating at 10 PM and getting home from a night out when the sun is rising. The last thing worth mentioning is that the weather in Barcelona is almost always nice and warm, there are few days of rain, and blue skies are common. For me, this sets it ahead of other European cities like Paris, London, and Berlin. If you love traveling or would like to live abroad, definitely put Barcelona on your list. For me, it’s been one of the most amazing years of my life. 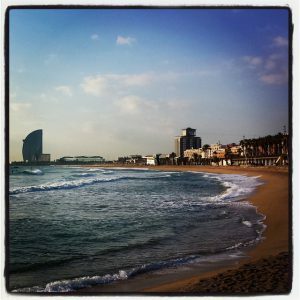 Barcelona is an incomparable place to work, to study, to learn and to live. I’m already looking forward to returning. Cool article! You have to check out Salvador Dalí’s hometown of Figueres! He designed his own museum in the old theater there and it’s incredible. It’s also his final resting place. There are long lines, so get there early! It’s about two hours from Sants on the AVE. I have actually driven through there but we didn’t stop to see the museum just because we prioritized seeing other things. I for sure will make it there sometime though. Thanks for the recommendation! What a great comprehensive tribute to a fabulous city! It’s me. Jaime !! There are a lot of towns and mountains waiting for you on your way back to Catalonia. it would be great to me to have the chance to show you new places. You make me laugh Ethan! I really enjoyed reading your article. As a catalan person I’m very happy to see how a foreigner (now half catalan) are able to know the culture and the people of this amazing city. Felicitats i salut! I was curious about what an American think about my city, and I have to say that I really enjoyed your comments. Thanks for sharing your feelings. Great to hear that you enjoyed! Great article Ethan!! The vision you have of the city is very accurate. Every day I’m more convinced about the luck I have by living here.